For people living in Britain and Ireland, Candytuft in the form of a cultivar is associated with neat, edged flowerbeds in gardens and parks in the height of summer. 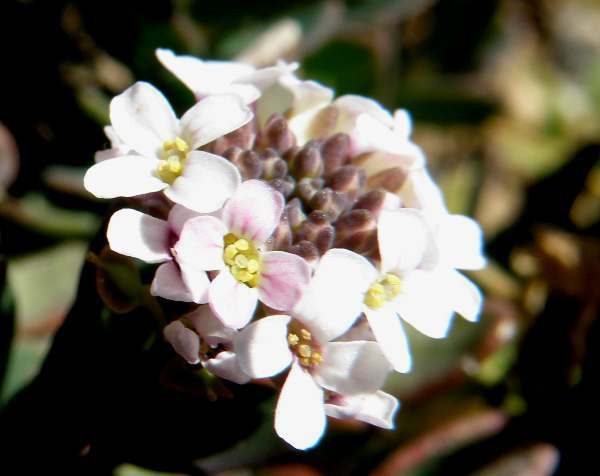 The flowers of Burnt Candytuft, a dwarf rock plant, are 3 to 6 mm across and have four notched petals; they are variable in colour and can be white, pink or mauve. Stems range from 3 to 35 cm tall and have a rather woody base. Burnt Candytuft is found in the western and central Mediterranean from Spain eastwards to Greece and also in Sardinia, Sicily and Crete. This member of the brassicaceae (Cabbage family, formerly known as cruciferae) grows in rocky habitats in the hills and mountains. Burnt Candytuft blooms in springtime. Aethionema comes from aitho- meaning to scorch, and -nema meaning a filament or thread - hence the genus name refers to a scorched filament or thread. 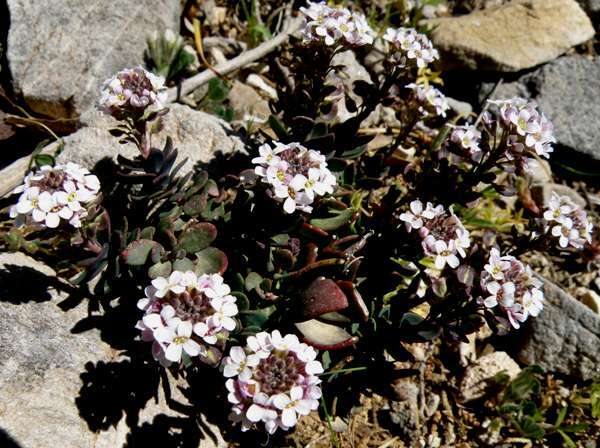 The specific epithet saxatile means 'found growing among rocks'.